What Purpose Do the Great Mathematical Problems Serve? Federico Casalegno on Designing Connections: "Ch@nge"
Newton, Darwin and Einstein are very likely the greatest scientists in history. James Watson and Francis Crick also deserve a special mention for deciphering the structure of DNA in 1953 –whose fundamental importance for copying the genetic material “did not escape their notice”, as they took special care to point out. And in a very different and not strictly scientific sphere there is physicist Timothy Berners-Lee, who in 1989 created the world wide web at CERN. The www has triggered a sweeping social transformation of our world much larger than that produced by Gutenberg in the 15th century. All Englishmen, by the way, but for the American Watson (who nevertheless worked in Cambridge, England), and Einstein, who was German by birth but who renounced his citizenship. Einstein was out of Germany when Hitler seized power in 1933, and he never returned to his homeland. Two years earlier the book A hundred authors against Einstein had been published in Leipzig, of which he said: “If I were wrong, one professor would have been enough”. And in May 1933, torchbearers in public book burnings put his books to the flames, along with those of many other authors, particularly Jews. There is a tendency to believe that Einstein’s discoveries were only theoretical in nature; he is, unquestionably, the supreme theoretical physicist. However, his discoveries have also generated numerous practical applications, as every conceptual revolution is always followed by major technological advances –a point worth noting by all those who insist that research should be essentially ‘practical’. The “very revolutionary” work on the photoelectric effect in 1905, Einstein’s great contribution to the nascent field of quantum physics and the reason for his Nobel prize, has been the basis for uncountable applications. But, in the popular imagination, Einstein has always been linked to relativity. In 1905 (his Annus Mirabilis) he developed his Special Relativity, which becomes essential when very large speeds (comparable to the speed of light) are involved, for which Newtonian mechanics is no longer adequate. Its consequences (setting aside E=mc²) are far-reaching, as relativity modifies the absolute and separate character of Newtonian space and time and merges them into a single spacetime. As noted in 1908 by Hermann Minkowski, Einstein’s former teacher at the Zurich Polytechnic, “only a kind of union of the two will maintain an independent reality”. Also important, the very idea of ‘force’, essential in Newton’s mechanics– would yield in favour of that of ‘field’. The term ‘relativity’, however, is rather unfortunate: the theory highlights what is invariable under certain conditions –the physical laws, which therefore (and fortunately), are not ‘relative’. The Spanish philosopher Ortega y Gasset –who accompanied Einstein during his visit to Spain in 1923– immediately noticed this aspect. Einstein himself occasionally used Invariantentheorie, but it was already too late to change the name ‘relativity’, as it was already established. 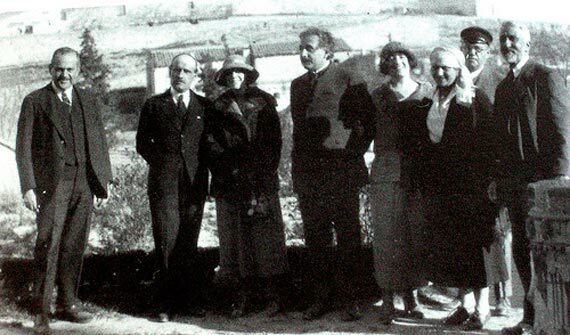 Albert Einstein in Toledo, 6 March 1923 (Ortega y Gasset Foundation). Nevertheless, the towering work of Einstein -the centenary of which we are celebrating- is his General Relativity (GR) of 1915. Conceptually, the GR equations are simple: geometry = matter. In other words, the distribution of matter determines the curvature of spacetime: it may be said that gravity is the dynamics of space-time. As a theory of the gravitational field, GR is the basis of any cosmological or astronomical consideration; for example, it accounts for Mercury’s anomalous perihelion, which cannot be explained by Newtonian mechanics. But it also has unexpected consequences, ranging from philosophy, as it invalidates the Kantian apriorism about the supposed Euclidean nature of space (and in passing calls into question any other a priori knowledge), to other more mundane areas: the precision of the GPS would be impossible without GR. 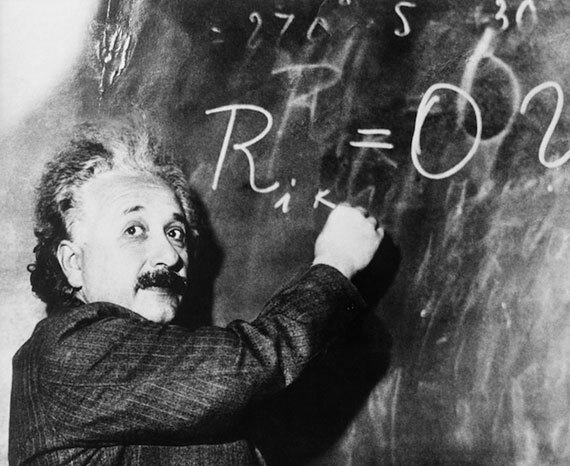 In fact, if our devices were to indicate the name of the scientist whose discoveries permit their operation, Einstein’s name would be everywhere. a real understanding of the nature and the value of the cosmological constant remains a challenge. Einstein also erred in his manifest hostility to black holes (today somewhat less black due to Hawking’s radiation, a result of considering quantum aspects), maybe because they already indicated that his theory of GR was not definitive. Aside from some Newtonian anticipations, and important GR-based work by Karl Schwarzschild, Lemaître, Chandrasekhar and others, the study of the physics of black holes (whose name, dating from 1968, was coined by John A. Wheeler) began in 1939 with a paper on stellar collapse by Robert Oppenheimer (future scientific director of the Manhattan Project) and Hartland Snyder. 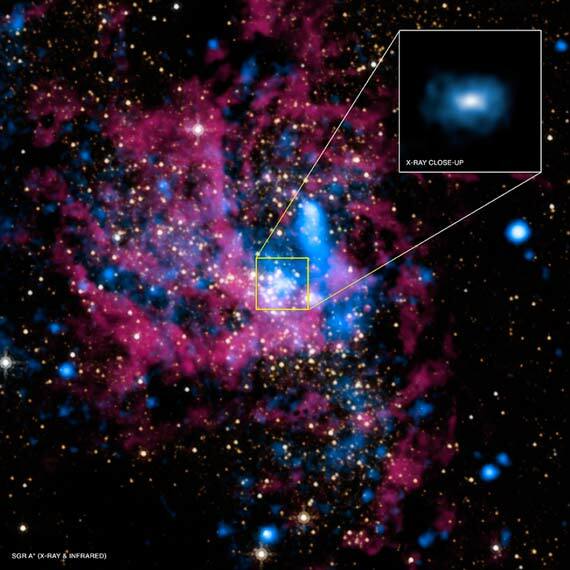 Today there is evidence of numerous black holes; for example, there is a supermassive one in the centre of our galaxy (the Milky Way), Sagittarius A*, with a mass of about four million solar masses. Finally, although Einstein observed that his GR equations give rise to gravitational waves (as Maxwell’s do allow for electromagnetic ones), he questioned their existence: in 1974, however, they were indirectly observed when studying the binary pulsar PSR B1913+16. Today, the goal is to detect directly the primordial gravitational waves produced after the Big Bang. This would permit studying essential aspects of gravity and the expansion of the universe in its origins, going back beyond the microwave background radiation coming from 380,000 years after the Big Bang, when the universe became transparent; it is, therefore, the oldest light in the cosmos. But, earlier, the universe was already transparent for gravitational waves; these will allow us to “see” it in its beginnings, prior to the images provided by optical and radio astronomy. As is only natural, Einstein was a man of his time: the physics of elementary particles, essential to many advances, had yet to be developed. His failed attempts towards the unification of gravity and electromagnetism, possibly conditioned by his dislike of ‘orthodox’ quantum mechanics, would today have followed other pathways. This rejection was due to the fact that in spite of its deterministic equations, quantum mechanics has probabilistic aspects: the wave function –the evolution of which is deterministic– cannot be observed directly. For this reason, and in contrast to Bohr and Heisenberg, the fathers of the ‘orthodox’ Copenhagen interpretation of quantum mechanics, Einstein believed that it failed to provide a complete description of physical reality: “God does not play dice”, he said. This deeply-held conviction, which he maintained to the end, contributed to his progressive scientific isolation. Today, however, the measurement problem in quantum mechanics continues to be a challenge. Einstein’s independent judgment –from which he had benefited so much- prompted him to continue his path alone. In fact, Einstein was a solitary both personally and scientifically; this is why he left no school as other very creative physicists such as Paul Dirac or Richard Feynman, also Nobel prizewinners. “Maybe I have earned the right to make my own mistakes” Einstein once observed ironically. But neither all of them were mistakes, nor did they diminish in any way his scientific standing: no one, not even himself, could always be right in front of the profound problems that occupied his penetrating mind. Einstein was extraordinarily popular, particularly after the confirmation in 1919 of the bending of starlight by the Sun as predicted by his GR. Besieged by journalists and photographers alike, he even said that his profession was that of “male model”. As is he were a modern oracle, he willingly answered wide-ranging questions to the delight of the press. In his family life, however, the European Einstein did not reach very high standards; not even his dedication to science can provide an excuse for some aspects of his behaviour. In social terms, Einstein lined towards social democracy, and showed great concern and integrity; according to C.P. Snow, he was “unbudgeable”. He also had to confront some extreme situations: on 2 August 1939 he abandoned his public anti-war stance to write a letter to President Roosevelt which contributed to the beginning of the Manhattan Project for the atomic bomb but, after the war, he returned to his pacifist convictions. In 1959, days before his death and at the height of the Cold War, he signed a manifesto with Bertrand Russell which would be the basis of the Pugwash Conferences. His conscience guided his public conduct: he censured Stalin’s regime, racial segregation in USA as a “disease of white people, not of black people” and criticized McCarthyism, to which he opposed civil resistance. In 1952 Einstein turned down the presidency of Israel: “I know something about Nature, but practically nothing about men”, he declared. Taken literally, this statement could explain his well-intentioned but utopian belief in the need for a universal government; it would have been interesting to know his opinion of Orwell’s 1984, if he ever read it, with its much darker view of supergovernments. The evolutionary basis of human nature -so little inclined to the Rousseau ideal of the noble savage- or the theory of evolution in general did not interest Einstein much, in contrast with the great physicist Ludwig Boltzmann, 35 years Einstein’s senior and much revered by him. Einstein’s achievements produce the same admiration that Feynman expressed in front of Maxwell’s equations: “the American Civil War will pale into provincial insignificance in comparison with this important scientific event of the same decade” (the 1860s). In the one hundred years since the GR, physics has taken great steps forward on the path to the unification of its laws and towards the geometrization of Nature that Einstein himself outlined. The fundamental problems that he was unable to solve still determine the frontiers of our knowledge. Many physicists consider that the structure of quantum mechanics, which never satisfied him, is still not definitive; Einstein would today follow the development of the second quantum revolution with great interest (and a smile). Quantum gravity, the necessary union of two still immiscible theories, awaits the arrival of a new Einstein; meanwhile, its traces are searched for at the origins of the universe from observatories in the South Pole and the Planck satellite. These new measurements of the cosmic microwave background are testing inflation models (the enormous, but extremely brief exponential expansion of the very early universe) and its connection to particle physics, quantum gravity and, perhaps, even to string theory. All this may allow us to go beyond Einstein’s GR which, as it does not embrace any quantum aspects, must be considered as an approximation to a more complete theory. For all these reasons, and in view of the scale of the challenges faced and the frequent trivialization of knowledge and culture, it is worth concluding by recalling what Einstein stated in 1952 and that applies to the great scientist himself: “There are only a few enlightened people with a lucid mind and good style in each century. Their legacy is one of the most precious possessions of mankind… There is no better response to the modernist arrogance of today”.